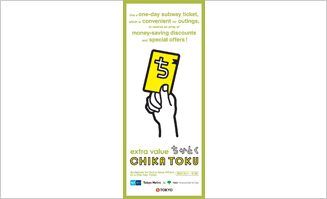 "Chikatoku" is a service to provide 1-Day Open Tickets privileges which is managed jointly by Tokyo Metro and the Tokyo metropolitan government's Transportation Bureau. You can also confirm the information on the WEB site of "Let's Enjoy Tokyo". You can confirm the applicable passes for Chikatoku from here. Let's Enjoy TOKYO has lots of information on events and places of interest in Tokyo. Check their website by clicking on the link below.